To many South African brandy drinkers, Martell is a well known household name. 5 star and VO blended brandy come to immediate mind. But what most don’t know is that the house of Martell is actually the oldest and one of the finest Cognac houses in the world, and South Africa is the only place you’ll ever find a Martell named brandy. Established in 1715 by Jean Martell, the house has a legendary history of firsts, including being the first Cognac house to supply European Royalty and Nobility in the early 19th century and the first Cognac brand to reach the far off shores of Asia, the USA and Australia shortly thereafter. It is currently the number two Cognac brand in terms of total sales internationally, but most importantly it is the the number one Cognac brand in the prestige segment of that market – it’s XO variant proudly being the most sought after XO in the world. During the darker years of South Africa’s segregated history, trade embargoes on the country prohibited the import of international goods, and spirit production was all done locally, driving the huge demand for, and success of one of SA’s longest standing tipples, blended brandy. To capitalise on exponential growth of this spirit in the 1950’s, KWV began producing Martell VO and 5 star brandies under licence from the great Cognac house itself. And they enjoyed huge success over the years with it. But ever since the lifting of trade sanctions on South Africa, and the influx of international spirits that flooded in, blended brandy has been in free fall. A trend that has ultimately led to the complete phasing out of Martell brandy – once current stocks are sold, there will be no more available. In its place, Martell is preparing to formally launch an exclusive Cognac range in South Africa in the coming months. Martell’s charges in South Africa will be led by the Caractère, a light and very fruit driven style Cognac – lots of white fruit with subtle apple and pear – while still retaining the ever telling signature Cognac spices of cinnamon and clove. A great variant to launch with in South Africa, given its very fruit forward palate, a lot more aligned to the profile of our premium Cape Potstill Brandy. Set to retail around the R400 mark, it is positioned between a VS and a VSOP grade Cognac, and cleverly will open up a new option for those Cognac fans looking to upgrade from a VS but not yet being able to afford a VSOP grade product. The next step up the Martell family tree introduces us to Noblige. “Round, generous sensuality, beautifully balanced with sweet fruity aromas and complex woody notes”, is how the house formally describes this variant. For now we have to take their word for it, as when we sat down with Etienne to do a formal tasting, there was only one bottle in the country, and that was certainly not to be opened for tasting! But as the largest imported spirit in China, and the no 1 Cognac in Asia, we’re pretty sure it will live up to it’s name. South Africa is only the second market in the world where this expression will be sold, even better for us!. On the shelf at around R630 the Noblige is a step up from a VSOP, with older eux de vie being used in the blend, to give drinkers a more premium experience. As with Caractère, another clever positioning, rather than taking on existing and established VS and VSOP variants in the market with their own, Martell rather opening up an intermediate step for consumers on the trade up path. 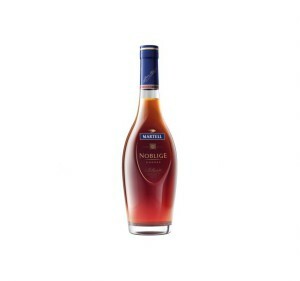 Following Noblige upward in the range is the Cordon Bleu, a legendary Cognac in the house of Martell. Created by Edourd Martell in 1912, the blend has remained largely unchanged for over 100 years, and contains a strong presence of Borderies eaux de vie (one of the more rarely used of all the Cognac grape growing regions), that gives Martell its signature flavour. Plumbs, apple and cinnamon abound on the nose with rich fruit and spices on the palate. A delectable indulgence for sure, Cordon Bleu will retail in the vicinity of R1800. The last retail variant, and flagship of the House of Martell is the fabulously dark, rich and complex XO. The standout for me in the range (though Cordon Bleu was very a very close second), it is crafted from over 150 different eaux de vie’s, ranging from 30 to 50 years in age. A classic cognac style XO, given the more dominant use of traditional Grand and Petit Champagne crus in its construction. Martell XO Cognac shows loads of spice, rich fruit and nuts on the nose, with gentle wood undertones, complemented by a fruit laden palate with fig and walnuts. Definitely a Cognac for the finest of occasions, and one to be sipped and enjoyed slowly and with reflection. Superb. Exciting times ahead in South Africa for the oldest of the big Cognac houses. Cognac appreciation levels have been growing rapidly in South and Sub-Saharan Africa and with a range as impressive and diverse as this, it is surely only a matter of time before the blended brandy past of Martell is long forgotten. Its appreciation in South African Cognac circles is an inevitability, and Martell will surely follow in the footsteps of other big Cognac houses already doing so well in local markets. Watch out for Martell Cognac promotions happening from October, with a particularly interesting one in JHB. Watch this space for more details soon!